Grant Twiggy Baker, not one to shy away from pits big enough to park an entire heard of elephants in, has in the past 6 months plastered his face all over the internet. Back in July, he sent the South African surfing community into an absolute froth fest with his submission into the Striped Horse Challenge. Next was his Nazaré Challenge win back in November 2018. 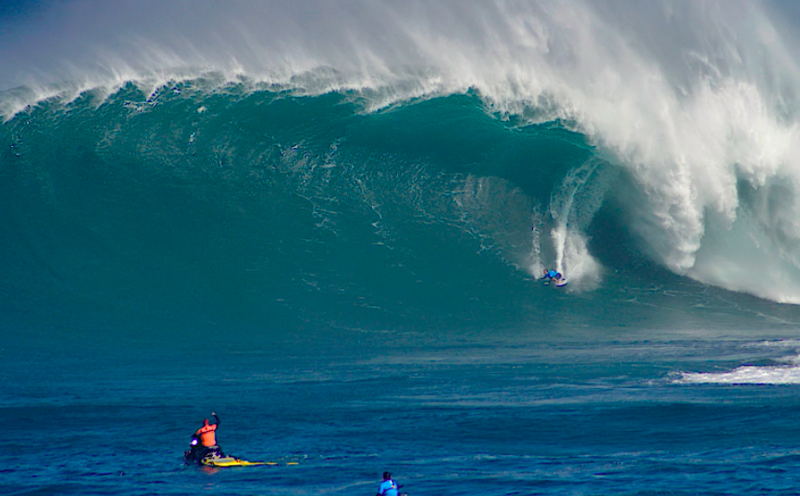 Most recently Twiggy, the big wave tactical beast, full on throat punched a double up ledging Pe’ahi freak… where he dropped balls first into a flippen bomb. What came next was a violent explosion which saw the boss get SPAT out and left scrambling, separated from his board. The wave earning a nomination for the WSL Ride of the Year 2019. Go ahead and hit play this thing’s an absolute gut buster as well as the cover shot of the latest mag 43.2 -The Crime Issue! Zigzag has NO PAYWALL and we want to keep it that way. Zigzag is committed to producing top quality surf journalism. Since 1976 we’ve been the MOUTHPIECE OF SOUTH AFRICAN SURFING, and at the FOREFRONT OF AFRICAN SURF DISCOVERY. As we grow we’re focusing more attention on important social and environmental issues as they relate to surfing and the ocean, while still delivering the BEST VIDEOS, IMAGES and SURF STORIES to froth you out! Our content takes a lot of time, effort and money to produce. Advertising doesn’t float the boat alone. We need our audience to back us too. So if you appreciate what we do, come aboard! THE BEST WAY TO SUPPORT THE ZAG IS TO SUBSCRIBE. You get AFRICA’S FINEST SURF MAGAZINE delivered to you every issue and your contribution keeps the wheels turning across all our platforms: PRINT, ONLINE AND SOCIAL. We offer several DIFFERENT SUBSCRIPTION DEALS and SPECIAL OFFERS to those who sign up for 2 YEARS or on DEBIT ORDER. A roundup of the final heats.